This article from TNR was written by Ryan Lizza. When John Kerry was a swift-boat commander in Vietnam, his job was to steer his small, noisy vessel down the Mekong Delta in an attempt to draw enemy fire. As The Boston Globe explained in its excellent series about the candidate last June, "Kerry's mission was to wait until hidden Vietcong guerrillas started shooting, then order his men to return fire." Not surprisingly, swift-boat crewmembers were frequently shot. The commander of these operations once estimated that his men had a 75 percent chance of being killed or wounded. Kerry himself was injured three times. Worse, the little money Kerry did have, or the money spent on his behalf by so-called 527s, did not fund what would have been the most effective commercials -- those making an affirmative case for him. "Attack ads against Kerry and positive ads from Kerry should be the most powerful ads," says Mandy Grunwald, who made Bill Clinton's spots in 1992, "because Bush's positive case is known and the case against him is known." Yet the 527s have spent at least $28 million in the last two months on ads attacking Bush. And, instead of a biographical ad or positive spot in which the senator articulates his plans for the country, the gist of the Kerry campaign's advertising has been to defend him from Bush's tax-raising charge. "They are basically doing defense on taxes so far," says a top Democratic strategist. All of which has prompted concern among Democratic strategists outside the Kerry campaign. Some blame the strained relationship between Kerry's ad-makers that led to the recent departure of former adman Jim Margolis. Others blame the memory of the last Massachusetts Democrat to win his party's nomination. "One theory is that the Kerry people are obsessed with [Michael] Dukakis," says the strategist. "They are fighting the last war -- rapid response above all else." So what has Kerry been doing in the weeks since clinching the nomination? Raising money -- more money than any presidential candidate, Democrat or Republican, has ever raised in a single quarter. While Bush burned through over $50 million in the last two months, almost one-third of the total he has raised, Kerry banked $55 million. More important, the White House assumed the Democratic nominee would simply have no money to spend. But, within 48 hours of Super Tuesday, March 2, Kerry raised $4.6 million online. The money never stopped pouring in. Kerry raised $42.8 million in March alone, fueled by 200,000 individual online donations. "That allowed us to bridge the gap as we got into the traditional fund-raising," says Michael Meehan, a senior Kerry aide. On March 29, Kerry pivoted to wealthier donors and embarked on a monthlong fund-raising tour to hit up $2,000-check-writers in 20 cities. As Tad Devine, a senior Kerry strategist, pointed out in an April 21 call with reporters, Al Gore had just $9 million to spend from Super Tuesday to the convention. John Kerry will have about $100 million. But, instead of spending this money as it came in, the Kerry campaign made a decision to absorb Bush's blows and to rely on the effects of the 527s and the negative news from Richard Clarke, Iraq, and the 9/11 Commission. 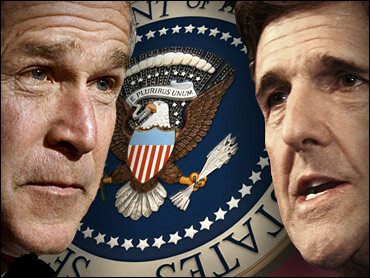 This decision may be remembered as the most brilliant move of the campaign or the one that cost Kerry the presidency. It is a large-scale version of rope-a-dope -- allow your opponent to unload with his most powerful punches as you hunker down and bide your time, waiting to unload in the next round, once the other guy has spent himself. If it works, it will partly be because Bush was hit with a blizzard of bad news that overlapped precisely with his anti-Kerry advertising schedule. "[Bob] Shrum was lucky, not good," says one Democratic strategist, speaking of Kerry's senior adviser. "I wouldn't want to plan my presidential election strategy around the machinations of some wacko Iraqi cleric and the Simon and Schuster publication schedule, but those are the only things keeping this 'don't shoot until you see the whites of their eyes' gambit plausible."